Mr. Olenoski began coaching Derby Little League in 1974 as a Minor League coach, then moved to the Major Leagues over the years and coached until 1981. Still wanting to be part of Derby Little League, he applied to be on the Executive Board of Directors, where he served as an officer until 2004. In 2004, after 30 years, he reluctantly resigned his position on the board due to a job relocation. Derby Little League thanks Mr. Olenoski for his heartfelt dedication to the youngest baseball players of Derby. 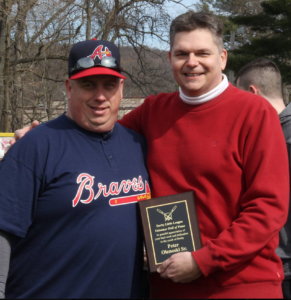 Pictured is his son, Pete Olenoski, Jr., accepting his dad’s plaque and recognition of our deepest appreciation for his time and effort.